After Nike all but claimed World Cup victory earlier in the week, Adidas has hit back with a combination of blows, talking up its reactive tactical campaign and the fact that it’ll be an all-Adidas final. Prior to the two semi-final matches this week, Nike touted its performances on and off the pitch, and, as though planned by the sports marketing gods, both semi-finals included one team that wears Nike kits and one that wears Adidas. In a triumph for the Official Sponsor, both Adidas teams were victorious, meaning that for the first time since 1990, two Adidas-sponsored teams will play in the FIFA World Cup Final. But in addition to the reflected glory of on-pitch success, Adidas is today also claiming it has achieved its stated goal of being the most talked about brand at the World Cup. The Adidas campaign, ‘All In Or Nothing’, featuring the hashtag #allin, has been represented across Twitter, YouTube, Facebook, Instagram and Tumblr, with Adidas’ crack social media team posting a combination of planned, anticipated and reactive content for the duration of the five-week event. The brand reported to Marketing that one outcome has been an increase of 4,865,502 followers across all platforms, more than any other sports brand. Adidas also brought the 2014 FIFA World Cup Brazil Official Match Ball, Brazuca, to life with the @Brazuca Twitter handle, acquiring more than 2.75 million followers during the tournament (currently over 3.32 million followers) and becoming the fastest growing profile of the FIFA World Cup. 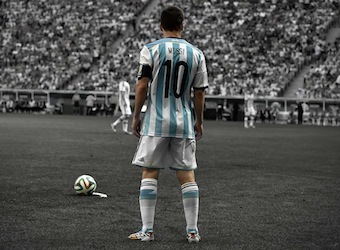 to tell our #allin or nothing story,” he said in a media statement. Further reactive and proactive content is planned by Adidas around the World Cup Final.